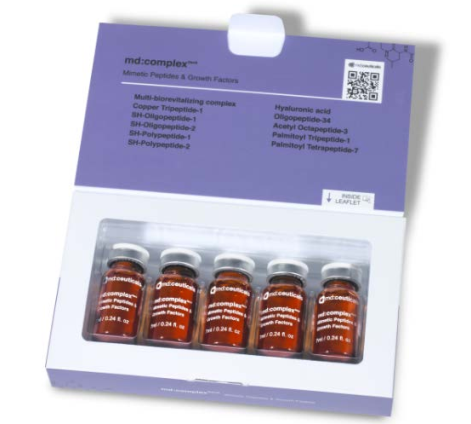 md:complex GenX Mimetic Peptides & Growth Factors works as an excellent BOOSTER to enhance the results of other professional treatments, providing additional anti-age, antioxidant, firming, regenerating, moisturising, revitalising and whitening benefits, improving the therapeutic effect. 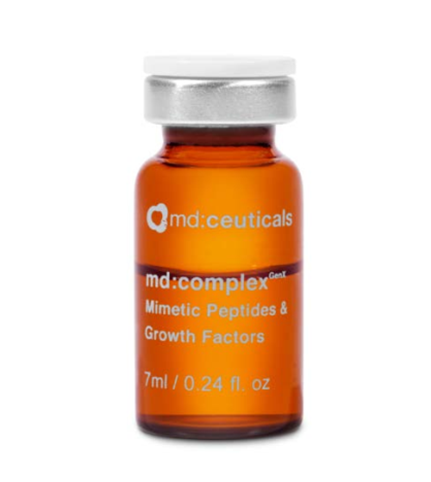 md:complex GenX Mimetic Peptides & Growth Factors formulation combines the antioxidant and revitalising effect of the Multi biorevitalizing complex (Hyaluronic acid + Amino acids + Vitamins + Minerals + Antioxidants) with the powerful efficacy of the new generation of Mimetic Peptides & Growth Factors. 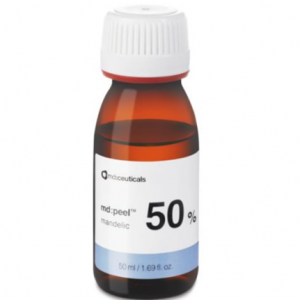 These have an identical structure to the naturally-occurring peptides, and drastically improve the overall appearance of the skin in a shorter time. Accelerates wound healing and skin repair, helping to create a fresh, youthful and glowing complexion. With a powerful antioxidant effect, it protects cell structures from oxidative stress, preventing premature skin photo-ageing. Removes uneven pigmentation, improving skin brightness and clarity. It decreases melanin synthesis by inhibiting the tyrosinase activity, decreasing the activity of the alpha-MSH hormone (melanocyte-stimulating hormone) and blocking the transfer of melanosomes to new keratinocyte cells. 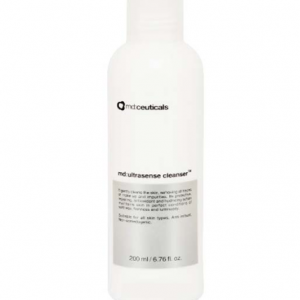 Stimulates hair growth by avoiding follicle miniaturization. It helps strengthen existing hair, while stimulating new hair regrowth. Limits the production and release of the neurotransmitters that control facial muscle contractions, reducing the depth of wrinkles caused by the repetitive contraction of the facial expression muscles. Promotes cell growth and proliferation, decreases skin inflammation and the accompanying skin damage and stimulates production of skin matrix components (Collagen I, Collagen Ill, Glycosaminoglycans, Hyaluronic acid, etc. 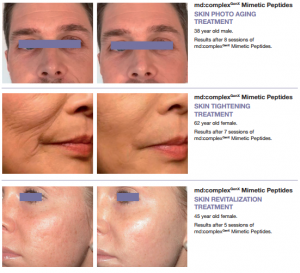 ), reversing the effects of skin ageing. By activating signalling pathways, it increases cellular and extracellular activity to nourish, rebuild, and remodel the extracellular matrix, the structural framework responsible for skin cohesion, firmness, and elasticity. Hydrates and soothes the skin, minimizing the appearance of fine lines and wrinkles. COMPOSITION: Hyaloronic acid + Multi-biorevitalizing complex + Copper Tripeptide-1 + SH-Oligopeptide-1 + SH-Oligopeptide-2 + SH-Polypeptide-1 + SH-Polypeptide-2 + Oligopeptide-34 + Acetyl Octapeptide-3 + Palmitoyl Tripeptide-1 + Palmitoyl Tetrapeptide-7.